It seems I was a wanted man for almost two decades, and I didn’t even know it. Besides that, in the end I wound up outing myself and getting fingered for writing three books. As a result, I am now a new member of the International Association of Media Tie-In Writers (IAMTI). 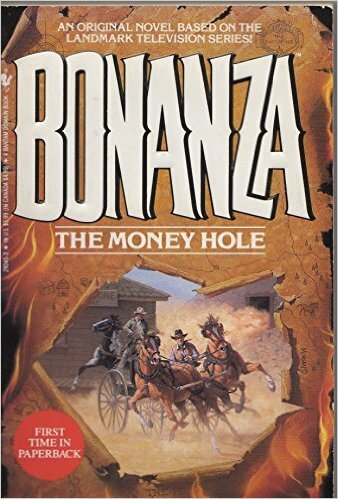 This story began two decades ago when Bantam Books asked the late Frank Roderus and me to write three books apiece, based on the Bonanza television series. We wrote them under the house name “Stephen Calder” and apparently set off an immediate search for the true identity of the non-existent Calder by another tie-in writer. The secret held until I started my author’s blog and did a piece on literary aliases in April of last year. IAMTW member David Spencer had been searching for the real “Stephen Calder” for years and googled the name earlier this month, as he had done periodically for the past two decades. His latest search connected to the “Aliases” blog on my website and outed me as one of the writers of the 1990s Bonanza series for Bantam. 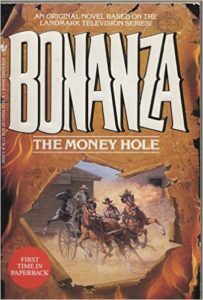 Tie-in writers are authors licensed to produce books based on other media, primarily movies and TV shows, but also comic books and even games. 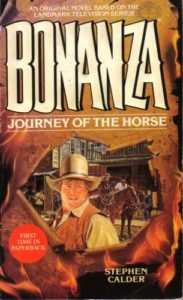 Since I had written books in the Bonanza series, I qualified for membership. What made the offer flattering was that the invitation was extended by Lee Goldberg, who did a lot of the novelizations of the Monk television series, and Max Allan Collins, one of my favorite historical fiction writers for his Nathan Heller detective series, which puts his Chicago private eye in the middle of such legendary events as the Lindbergh kidnapping and the Bugsy Siegel murder. Writing tie-ins is an art in itself and not as easy as you might think because the translation from one medium to another presents a variety of challenges. Too, the tie-in authors work under certain restrictions mandated by the rights owners. When I worked on the Bonanza series, I had Hop Sing visit an Opium den in search of someone, but the rights owners felt that inappropriate for their property, even if it had been a historical possibility. So, that was changed as it should have been at the request of the rights holders. Perhaps the best example of how tie-ins can work was illustrated by IAMTW member Paul Bishop, who reported on the book The Man in Black, which became the 1967 Dean Martin/George Peppard movie Rough Night in Jericho. The movie was different enough from the original book that a tie-in book was written under the movie’s title. As Bishop put it, “A book based on a movie that was based on a different book does not happen often.” Even so, it does illustrate the possibilities and permutations of tie-in writing. So, it was an honor to be invited by such established writers as Goldberg and Collins to join IAMTW based on such modest credits.